English educationist and communal worker; born in London Nov. 22, 1804; died Jan. 24, 1893. He was closely connected with the management of the following institutions: Jews' Free School; Jews' Infant School (honorary secretary from its foundation in 1840); West Metropolitan Jews' School; Jews' Emigration Society; Jews' Hospital; and the Anglo-Jewish Association. In Jan., 1877, he was presented with a testimonial in recognition of his long services in the cause of Jewish education. 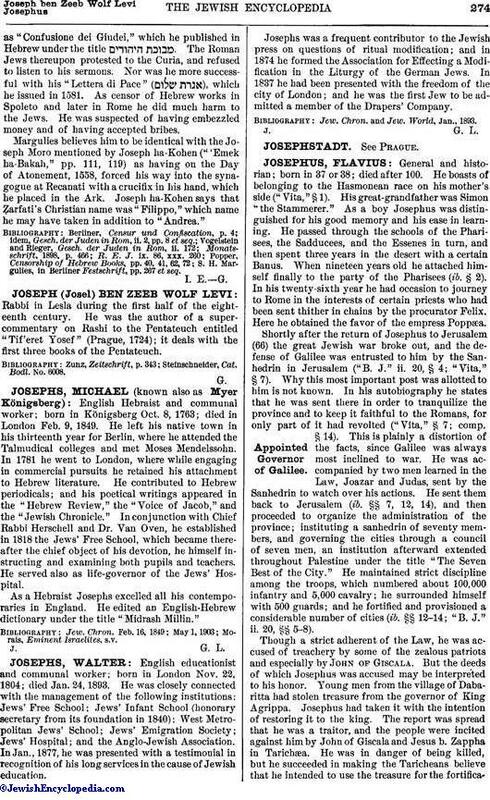 Josephs was a frequent contributor to the Jewish press on questions of ritual modification; and in 1874 he formed the Association for Effecting a Modification in the Liturgy of the German Jews. In 1837 he had been presented with the freedom of the city of London; and he was the first Jew to be admitted a member of the Drapers' Company. Jew. Chron. and Jew. World, Jan., 1893.